Southern Partisan Online - Is Mitt Being Neoconned? What does “stand with” Israel, if she launches a surprise attack on Iran, mean? Does it mean the United States will guide Israeli planes to their targets and provide bases on their return? Does it mean U.S. air cover while Israeli planes strike Iran? And what does Senor mean by Israel’s need to act “to stop Iran from developing (the) capability” to acquire nuclear weapons? The collective decision of 16 U.S. intelligence agencies in 2007 — that Iran is not pursuing a nuclear weapon — reportedly reaffirmed in 2011 — has never been rescinded. Nor has the White House produced any hard evidence Iran is building a bomb. Moreover, Iran’s known nuclear facilities are under inspection by the International Atomic Energy Agency. Undeniably, Iran, by enriching uranium to 3.5 percent, then up to 20 percent, has a greater “capability” than five years ago of building a nuclear weapon. But Japan, South Korea and Brazil also have that capability — and none has decided to build a nuclear weapon. Gov. Romney did not go as far as Senor, but he, too, seems to be saying that not only is Iran’s possession of a nuclear weapon a casus belli for the United States, even an Iran that is capable of building such a weapon is intolerable. Preventing what outcome is “our highest national security priority”? The governor seems to be aligning himself with Israel’s hawks who are demanding that not only must Iran swear off nuclear weapons forever, Iran must cease all enrichment of uranium, and dismantle the facilities at Natanz and Fordow. That appears where we are headed. Reportedly, Obama’s national security adviser recently briefed Bibi Netanyahu on the specifics of U.S. contingency plans to attack Iran. 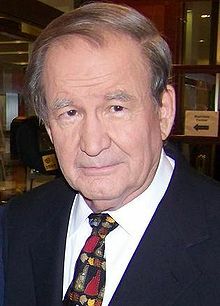 Patrick J. Buchanan is the author of “Suicide of a Superpower: Will America Survive to 2025?” To find out more about Patrick Buchanan and read features by other Creators Syndicate writers and cartoonists, visit the Creators Syndicate Web page at www.creators.com.